Laser cutting with Trotec machines outperform conventional cutting systems in terms of speed and productivity. Today, laser cutting can be done much easier and faster than ever before and can be used in a wide range of applications and industries. As one of the world’s leading manufacturers of laser systems, Trotec offers innovative laser cutting machines for diverse applications, such as cutting of acrylic, architectural models, foils and films, signage, paper, toys, wood, and much more. In all applications and industries, Trotec laser machines stand for clean, fast, and high-quality laser cutting. 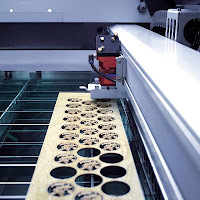 During laser cutting, there is no need for aligning or fastening the material. Users will never come into contact with open and moving machine parts. In short: A Trotec laser cutting machine is as safe to use as a CD player or a microwave oven, and it goes without saying that they additionally fulfil the most stringent safety standards. A laser machine from Trotec stands for maximum quality, reliability, performance and speed. Besides, laser cutting is extremely profitable. Laser cutting machines are not subject to wear and tear, will pay off quickly, and will maximize a company’s income.